I spend a lot of time in the bathroom. We all do. I bet next to the kitchen, it's the room where we all spend the most time. And I'm not being all TMI here. A lot of life happens in the bathroom. Going way back, I can remember as a kid watching my mom get ready in the bathroom mirror and watching my dad shave. And my sister and I measuring our bangs while Milli Vanilli's Blame It On The Rain blasted from the pink jam box that sat on top of the toilet. 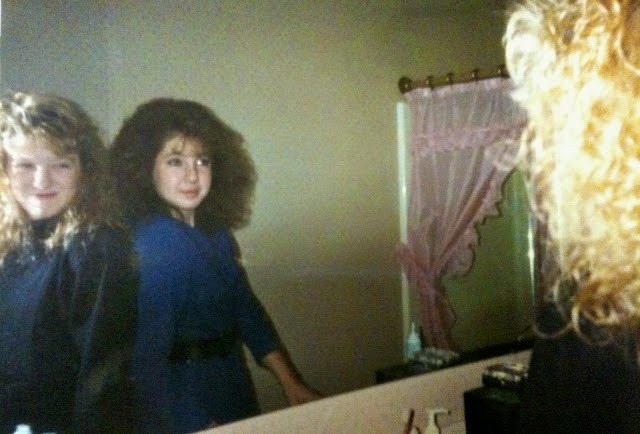 seeing who had the bigger hair. Years later, the bathroom is where I took all my pregnancy tests and found out I was going to be a mother four times over. The bathroom is where I bathed my sweet toddlers as I sat next to tub on the floor. So many cute toddler moments/antics happen in the bathroom. Here's Wade a couple years ago. The bathroom is where we celebrated potty-training victories of each of my kiddos. The bathroom is where I now go if I want alone time or if I want to hide from all those sweet children. Spending a lot of time in the bathroom is just what we all do. Even at blogging conferences. 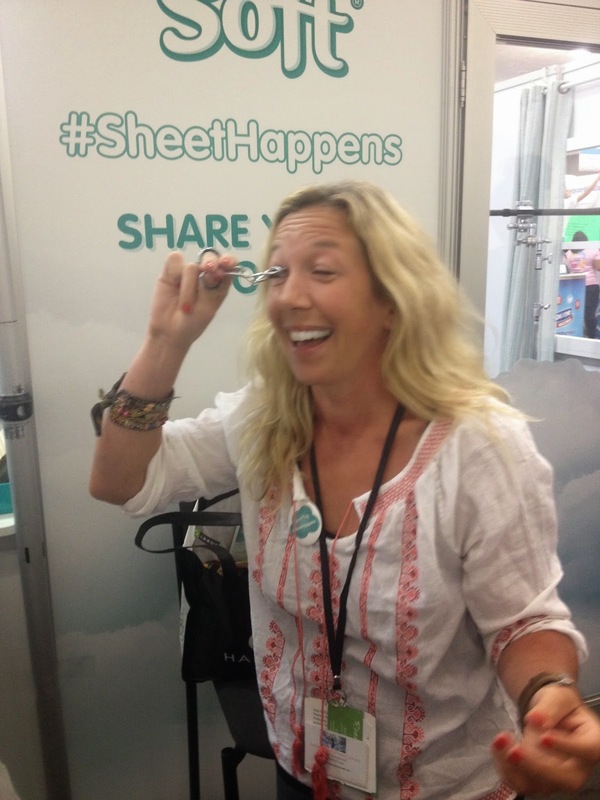 Last week was my first time at BlogHer and I found myself sitting in a bathroom in the middle of an expo hall. 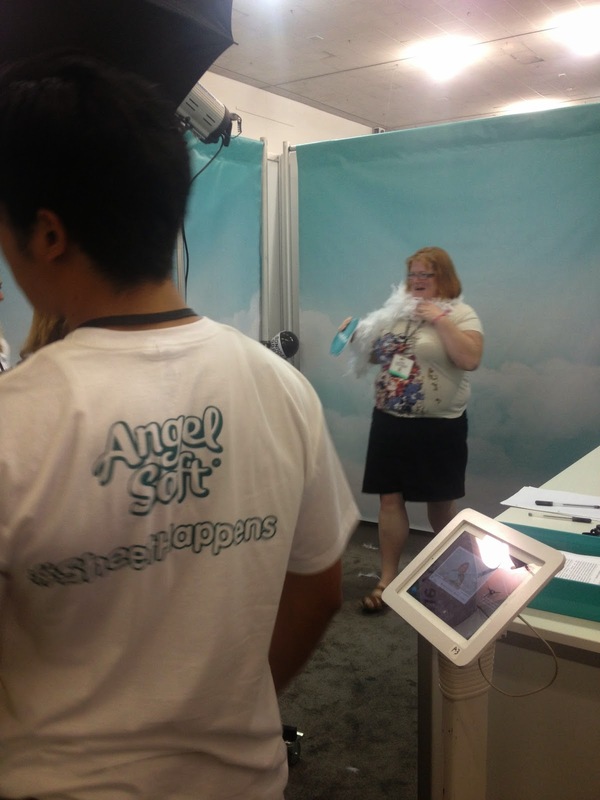 Me in the Angel Soft® Booth at BlogHer. 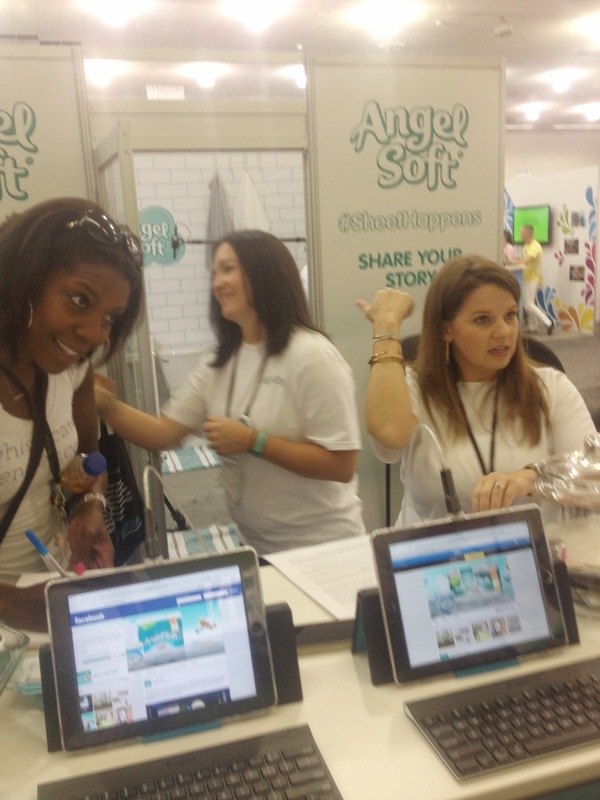 It was the Angel Soft® booth at BlogHer, Angel Soft® was one of the conference sponsors. Their booth was full of nice people that were having fun and that weren't afraid to talk about spending time in the bathroom. They asked personal questions like "do you hover or cover?" And didn't make it feel too weird. We laughed and talked toilet paper. It felt so comfortable and easy, I expected someone to blast Milli VaNilli any minute. And did someone say photo booth in the booth? Why yes, they had one with props. There's nothing I like more than a photo booth with props (and stellar lighting!). I don't know this lady, but she looks like she's having fun. I'm prepping for the camera by curling my eyelashes. My buddy Greta from Gfunkified.com and me and hamming it up in the photo booth. 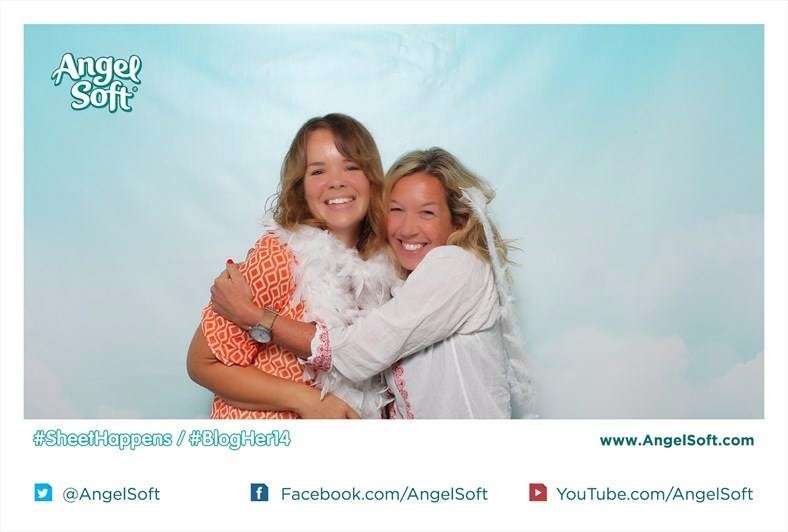 Not only did I have fun in the booth, I also learned a thing or two about Angel Soft® products. I learned that their bath tissue is made with two layers and has 60 percent more sheets per roll than some other brands. All of their messages speak to me on so many levels-- "An ideal balance of softness and strength" and "all the quality you need at a price that won't break your bank." But my personal favorite message Angel Soft® is using right now is the best hashtag maybe ever-- #sheethappens. 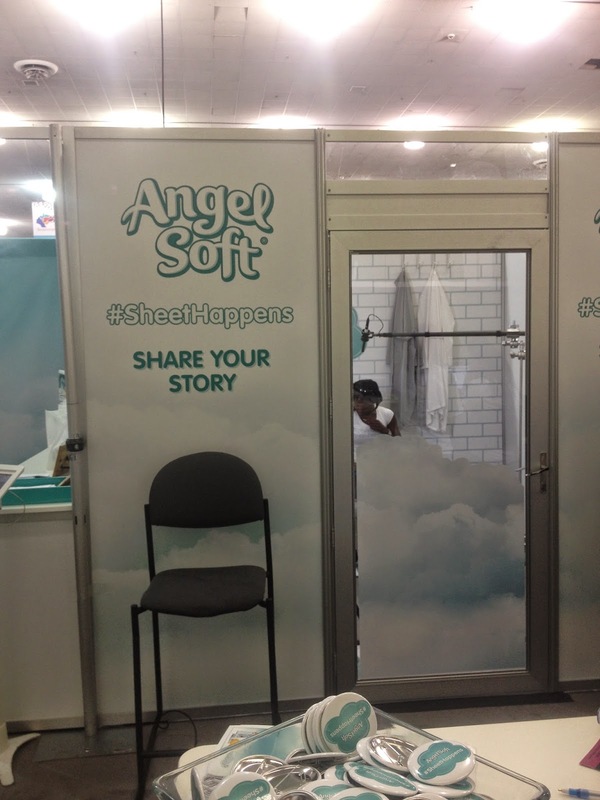 Since I spent time at the booth, I've not only been using Angel Soft® bath tissue, I've been using the #sheethappens line everywhere in my life. Check out the Angel Soft® web site to watch more. Now I get to give you a chance to win a year supply of Angel Soft® bath tissue and Angel Soft® facial tissue. Yeah, that's right. You can outfit the room you spend so much time in with Angel Soft®. The giveaway ends at 12 a.m. Eastern on August 12th. There are several ways to enter. So go ahead, enter and win. Imagine not having to go and buy toilet paper for a year! Check out the Angel Soft® web site. And the Angel Soft® Facebook page and on Twitter. who couldn't use a year's supply of Angel Soft?!?! I hope I win!!! One less thing to buy at the grocery store for an ENTIRE year?! Yes, please!! I want to win! Angel Soft is my brand! I would love to win a years supply of Angel Soft. What I wouldn't give for a free year's supply of toilet paper! I agree that is the best hashtag ever. Look at me, entering a giveaway for toilet paper. We all use it! I love Angel Soft so imagine my happiness at this! I love it! I Love Angel Soft! Thanks For The Great Giveaway! I smile every time I see you curling your eyelashes!! I love Angel Soft bathroom tissue. Angel soft is my favorite brand of toilet paper. It is very affordable but is still high quality. Winning a year's worth of Angel Soft .. would be Heaven. This would be amazing to win and this expo looks super fun! I love Angel Soft! Wish I could have been there at the expo, looks like everyone had a blast! This would be great for my family budget, we love Angel Soft! It would be wonderful to have that much toilet paper. Id love to win this, thanks for the giveaway on my fav toilet paper. Of course I would love to win a year's supply of toilet paper! Epic!